Feeling sore? Do you know what would be good for you? Bathing in radioactive water. That would be just the thing to relieve your aches and pains. But where, you ask, will I find this modern miracle? Look no further than Perth Zoo. 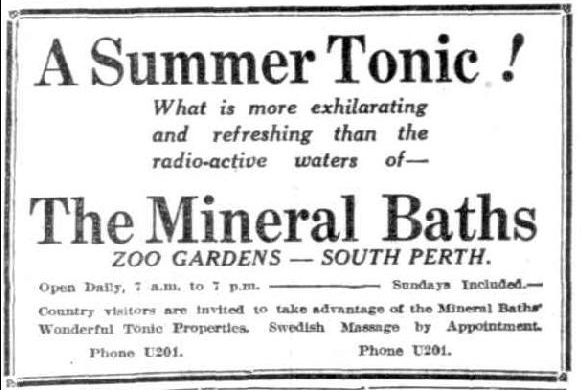 Discovered around 1904 when Colonel Le Souef bathed in the alligator pond to cure his rheumatism, the radioactive baths became one of the main sources of money for the ever-impoverished zoological gardens. In the 1920s, it cost just one shilling for admittance to the hot waters, although for a little more you could also get a Swedish massage from Madame Asta Idlund. Along side those suffering from rheumatism, radioactivity was thought to be very good for those athletes who made regular visits. But what about those radioactive alligators?